From MAX factory. A new development in the minimum factory collection: A combination of machines with girls! 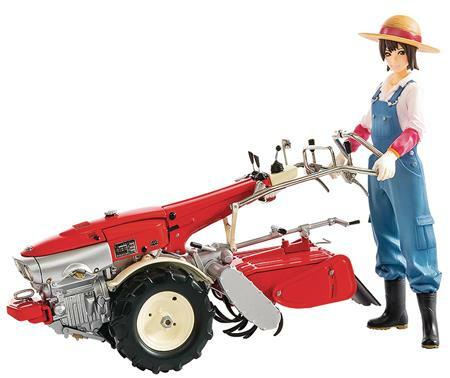 The Honda F90 Tiller, released in 1966 by the Honda Motor Company, has been transformed into a model kit now with special paddy field wheel optional parts. The model kit comes complete with parts to build a figure of Minori in the same scale: an original character designed by Shunya Yamashita. Minori has a typical farm girl look about her, and can be put together wearing either overalls or a tank top. Just like all the previous items in the minimum factory series, both the F90 and Inaho make use of multiple different cast colors as well as decals, allowing you to build a great looking model simply by putting the parts together! Build the models with your own two hands and enjoy the combination of machines and cute girls in your collection! This model of the F90 DOES NOT come with paddy field wheel parts.